Work 5 rows even in stocking st, ending with purl row. Break yarn. To shape neckline: with right side of work facing, join yarn and pick up and knit 22sts along lower edge of bonnet. Knit 11 sts from back of bonnet. Pick up and knit 22 sts along remaining part of lower edge. I get that break yarn means leave the 11 sts on and break yarn to leave a tail but then after that I get lost. The 11 sts still on the needle are at the top of the pattern and then it says to pick up 22 on the lower edge... do I use another needle and just hold the 11 for later? I'm so confused... if someone can help me sort out this part of the pattern it would be so appreciated. It is difficult to provide an exact answer without being about to see the pattern, as there is always the chance that the designer of this pattern has done something very differently to the normal method of shaping a bonnet, but I will give it a go. Usually when you get instructions like the piece you have just completed is at the base of the bonnet rather than at the top and the 11 stitches remaining are the centre stitches of the lower edge with 22 new stitches either side. 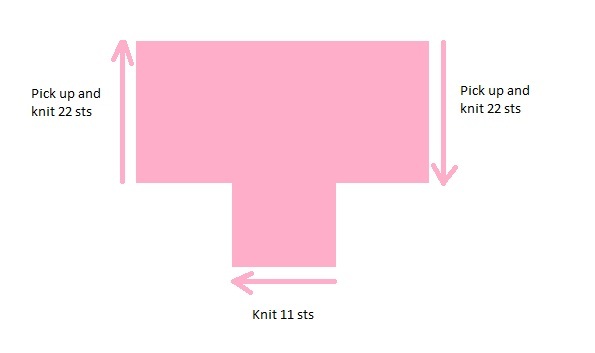 This simple diagram may or may not resemble your knitting so far, but it is a common way that bonnets are put together. Hope this helps in some way, if not please do use the contact form on the site to get in touch so that we can arrange for you to send me a copy of the pattern. That way I might be able to help your further.